tl;dr: Worker placement, resource management, area control, AND MAAAAAGIC. 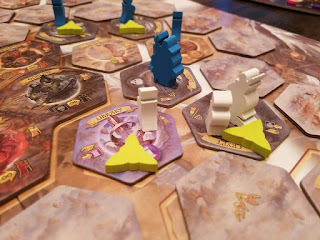 Getting to the Game: Archmage, more than any game I've played in recent memory, stands at a strange place in the complexity scale. At its core, it's area control with a little side game of managing your spellbook through worker placement. Boardgamegeek.com lists it at 3.5/5.0 in complexity, but I don't think it's that high. There's so much to look at and so many moving pieces that it sometimes seems like you're always missing something, but I promise you, you're not. Your eyes are lying to you. Have faith. 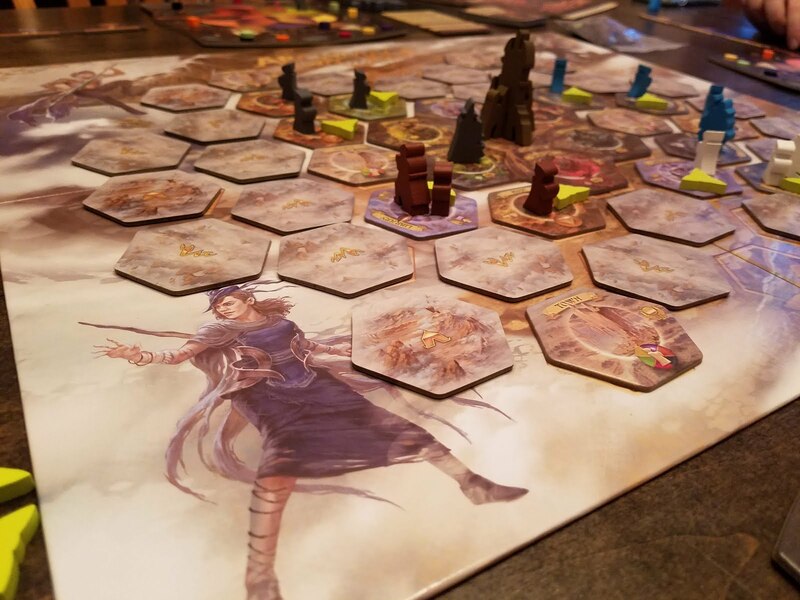 Each player gets their own cloister, represented by a tower board in front of them. Using it both wisely and efficiently will be the key to victory. 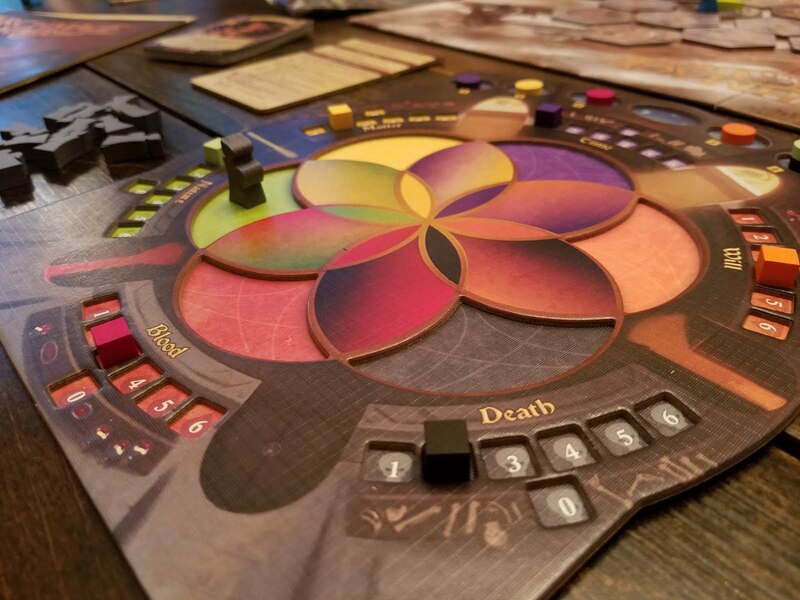 From it, you can track the progress of both the alignment of the planets (when all six converge, that's the last turn of the game) and of your disciples' devotion to each of the game's six elements. Depending on your game version, there's also a board that will house the slew of hex tiles designed to represent the field of conflict. (Non-collector's edition owners will lack a board, but it's not strictly necessary.) 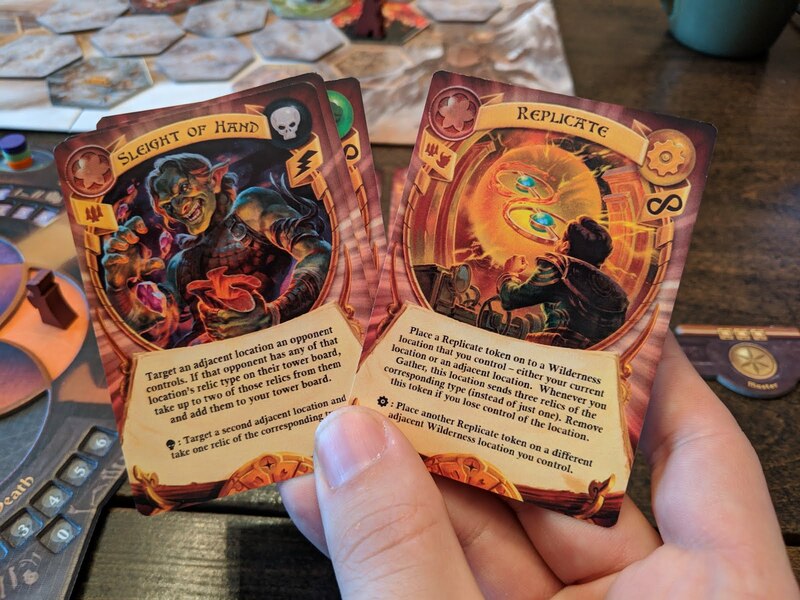 Various pieces in each player color are assigned, and finally, you get your own deck of spell cards, which is exactly the same as every other player's deck. There's one low-level spell for each of the six elements, six mid-level spells for the convergence of each with its neighbor, and six for mastering that base element. Playing the Game: Maintaining your spellbook is the first thing you do on your turn, and it will more or less decide what you do on your turn. For every follower-laden location on your tower board, you'll gain access to the spell tied to those locations. Once that's straightened out, you'll move one of the planets at the top of your board one step towards the middle, and then gain one element of that type. From there, you get five actions to spend, which mostly consist of moving and attacking. Casting spells don't cost an action, and you can cast them at literally any point during your turn, even as the very last thing you do. The more complex the spell is, the more elements it costs to cast, but you can also draw those elements from more sources. There are only five types of spell effects that can live in a space, and they each have their own token; generally speaking, they either prevent you from moving there or force you to spend one more action to get in. Attacking costs one action, and there's no dice rolling or anything; you attack, you win. Once you've done all five of your actions, depending on what kind of space you stopped in, something happens. That's the game in a nutshell. Obviously, there's more interaction between specifics, but it's all very intuitive. The tower-board-as-stat-tracker is probably the sexiest solution to an often-failed-on issue I've come across yet (I'm looking at you, Terraforming Mars). At a quick glance, you know exactly how much of each element you have, what spells you should be able to cast, how long until the game is over, and where you need to focus. It's functional while being really great looking, and I only want Tim Heerema-designed player aids going forward. I don't care if he's busy, call him and make him design your player aid. Publishing can wait. Exploring the board is also brilliant. There are plenty of games that do the "every tile is face down until you land on it" thing, but some shouldn't. Archmage absolutely should, and it separates early-game from mid-game perfectly. Imagine how much better Catan would be if each hex was face down and you had to build a road to find out if you wanted to build a house on it. (I didn't think that through before I wrote it down, but I'm sticking to it!) That's an awesome variant, and I'm gonna play it someday. Archmage knows that, due to how controlling hexes works for endgame scoring, players are going to quickly want to establish dominance over each of the five hex types. By forcing wizards to explore the map, there's a few turns of revealing and setting up with very little conflict as everyone spreads out. It's a really elegant way to ease into what will be some very brain-burning turns as you try to maximize your five actions. What works less well for me personally, though I understand the design decision behind it, is that endgame scoring is divided between your last spellbook and controlling hex types. At game's end, you'll get one point for every Fundamental spell in your book, two for every Advanced spell, and four for each Master spell. 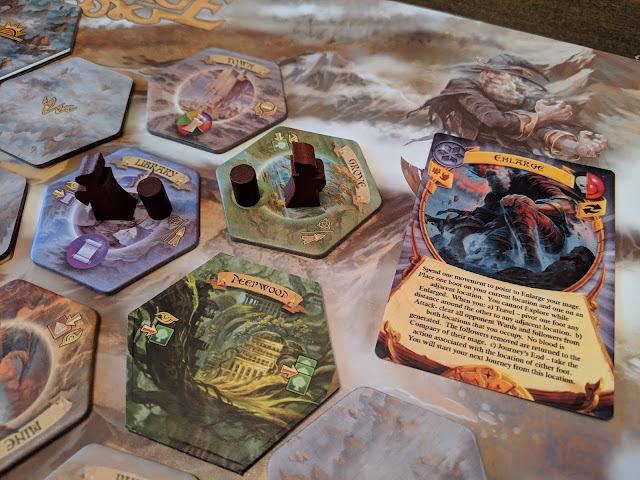 Compare this to two points if you control the most hexes of a type, and only one if you're tied with one other person (none if three or more players tie), and you'll see that the board is almost an afterthought. While it contains the land you'll draw your elements from, and battling for space is the primary way of gaining the Blood element, it's just a means to an end. As a big fan of area control as a mechanic, I was hoping it would be more relevant at the endgame. Conversely, this is a game about reaching your ultimate potential as a mage before the planets align, and not about being a farmer, so I get it. Ultimately, the relative greatness of any game is going to be how you feel after losing it. I was trounced pretty handily in my first game, and I had a hard time sleeping that night thinking of ways I would have done things differently. The first thing I did when I woke up was check a rule I thought I had wrong the night before. 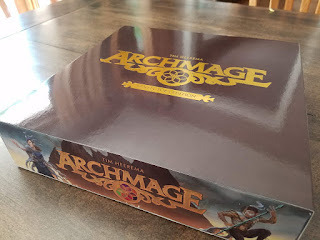 And when I got to work, still thinking about Archmage, I got a message from one of my regular game group players that said, and I quote, "p.s. I'm still living in a dream world and the real world is Archmage." edited 11/20/2018 - With a new expansion headed to Kickstarter, Starling games asked me to have a look at the expansion content and give them my thoughts. I'm adding this section to the middle of my existing Archmage review for context. 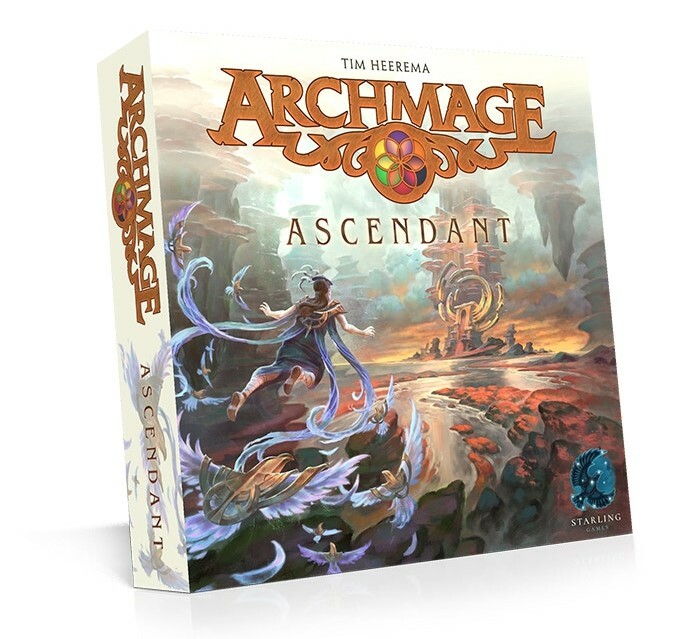 Additional Gameplay: The Ascendant expansion adds more to an already-full box, but does so in a very wise fashion, implementing the expansion content in four new "modules." While they're a little uneven, what's here brings some much-needed variety to the Archmage experience. The first throws completely new fundamental spells into your book, giving you "boosted" magic to play with directly from the beginning of the game. Some of them modify already-in-place mechanics: now instead of wards you can place magic barriers, which sit on hex edges and completely prevent entry from that edge. Others give you access to an ability that, frankly, should have been there from the beginning. Return Home is the base time spell and allows you to immediately return to your mage tower without consuming a movement point. Each of the new fundamental spells have the option to allow you to spend an additional relic, and more or less do that thing again. Boosted Magic Barrier lets you put another barrier on the same location, but a different edge, Return Home allows you to teleport to a space up to two locations away from your tower, Sleight of Hand (the new death fundamental spell) targets an opponent-controlled location and steals relics from their tower to yours, and boosted targets a second location. Our game with these felt far more interactive and PvP-intensive. It seems that there may have been some concern among players that the original early game was too "exploratory" and not cutthroat enough. I disagree with this, and think the original early game was perfectly thematic for a new mage trying to cement their hold on the world's resources. To each their own. Module two takes your six advanced spells and swaps them out for new ones. If the first module was aimed at making the early game more interactive, the theme continues here. These spells seem oriented towards making the board feel smaller, allowing you to circumvent positioning in new and in one case, very creative ways. The new Fly spell lets you spend a movement point to move as far as you'd like in one direction, only being affected by the tokens in the location you land in. Hasten makes locations you control friendly to you by negating movement points spent to enter them. The best of these six new spells, though, is Enlarge. There's a wall of text explaining exactly how it works, but it boils down to this: You're now ridiculously big. Your wizard is replaced by two boot tokens that can occupy two adjacent spaces, and when you Travel you literally pivot one boot to another, moving as far as you want with each foot. You can't explore this way (you're too big? ), and when you attack, you literally clear both locations your feet are in and generate no blood, but return all the pieces in both back to their owners. Thematically, it's ridiculous, and I absolutely love it. The third module introduces "Places of Power" as new hexes that can be discovered. One for each of the base elements is added to setup and when discovered add an additional relic of the space's type. However, ending your turn on a place of power will allow you to "Hoard," and collect THREE relics of that location's type. If you manage to secure and hold control of one of these places when you update your spellbook, then you gain access to that place's ability. 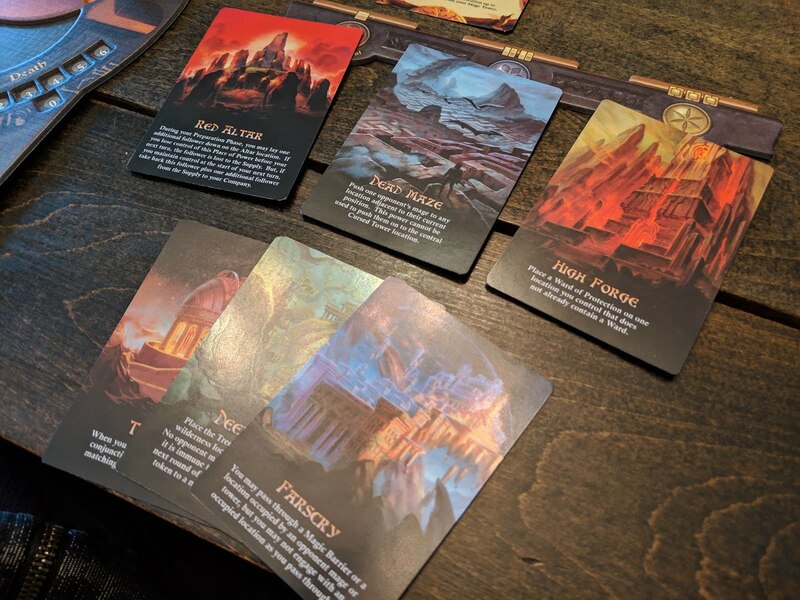 The Red Altar, for example, allows you to drop a follower there during your preparation phase, and if you maintain control through another turn, you reclaim that follower and one more from the supply into your company. Dead Maze allows you to push any opponent's mage one space from where they are (except onto the cursed tower). Of all four modules, this one was BY FAR the most interesting and brought a whole new level of area control to the game. If you've read the review above of the base game, you'll note that this was one of my concerns--that it's more about managing your spellbook at endgame than it is about area control. That's still true, but now there are very real and tangible benefits to playing both games at once, and the pendulum is swinging back to the area control side. Finally (yes, there's more! ), the last module gives us Prophecy cards. These are hidden objective cards that add not only secret machinations to your to-do list, but also add some very sweaty press-your-luck shenanigans. 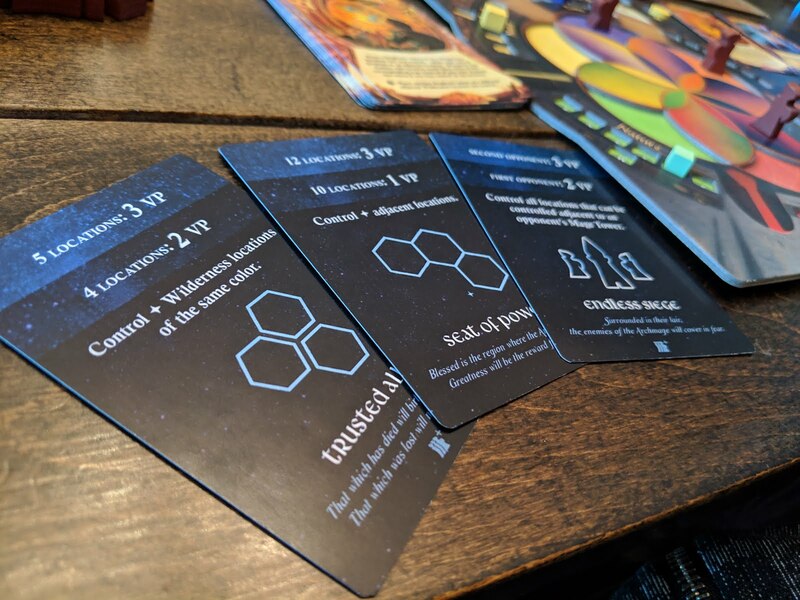 At game's beginning, each player gets three of these cards, and each one has an objective and then a harder version of that same objective (see examples below). If you meet the easier version, you can reveal the card and claim the points. If you stick it out, though, you risk losing the chokehold you had at the benefit of trying to get the higher point total. These cards are fun when added in by themselves, but are ABSOLUTELY BONKERS when you play an ultimate game with all four modules. 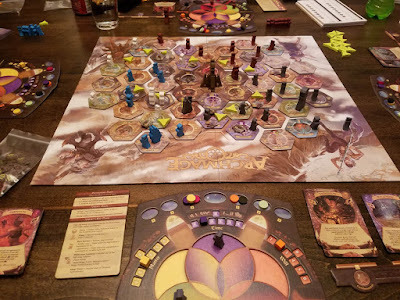 We only had time and energy to play one of these ultimate expansion games before the publish date of this review, and with the places of power adding more area control elements, the updated spells forcing us to attack each other and zip all over the map, being able to score a potential of nine additional VPs based on secret objectives? When a base game's scores average in the twenties? Well.... it was chaotic in the best possible way. To sum up this expansion, I return to a quote from my original review: I'm still living in a dream world, and the real world is Archmage. If you're at all a fan of the base game, you owe it to yourself to grab this expansion. If only to try out the modules piecemeal here and there to spice up games you'd be playing anyway. However, take great care in adding in all four modules. 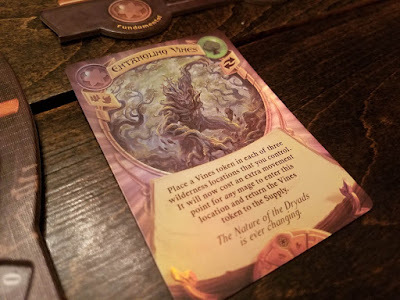 It turns the original experience from a carefully solemn foray into the world of magic into a ridiculous romp through what certainly amounts to a monster truck show for non-muggles. Just when you think it can't get any more crazy, someone turns themselves huge and begins stomping all over creation. Score: Come on. YOU CAN MAKE YOURSELF HUGE AND STOMP ALL OVER CREATION. WHY WOULD YOU NOT BUY THIS?!?!?? 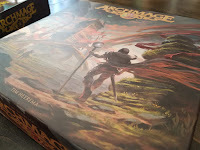 Artwork and Components: The artwork on the cards is great, though a little muddy (see next paragraph) in my copy. The tiles are similarly wonderful, though the iconography doesn't pop as much as I wanted it to. When looking across the whole board, with so many tiles and pieces on each hex, it can get a little noisy. The background art on the board and box are really nice, and I wanted more of that style. The spells are stylized more towards the element they're from rather than trying to evoke a unifying presence across the game. I was sent a copy of the collector's edition for review, so I don't have a regular one for comparison. The website lists the additions as a board, cloth bags for each player, a slipcase for the box (seen above), a score pad, wooden cursed tower (piece that goes in the center of the board), wooden ward tokens (also seen above), individualized player meeples, and gold foiling on the cards. 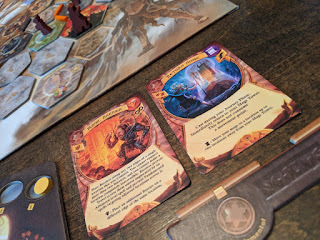 All of these are great additions to the game, the wooden pieces in both versions especially, but I think the gold foiling makes the card art muddy and the coloring impossible to distinguish. You still have the icons in the corner of the card, but when hunting through your deck looking for a spell, they all look too similar with the foiling. For a game that paid such obvious attention to the overall aesthetic (seriously, those tower boards), it's a shame that while the foiling provides a cool effect, it detracts from the game as a whole. 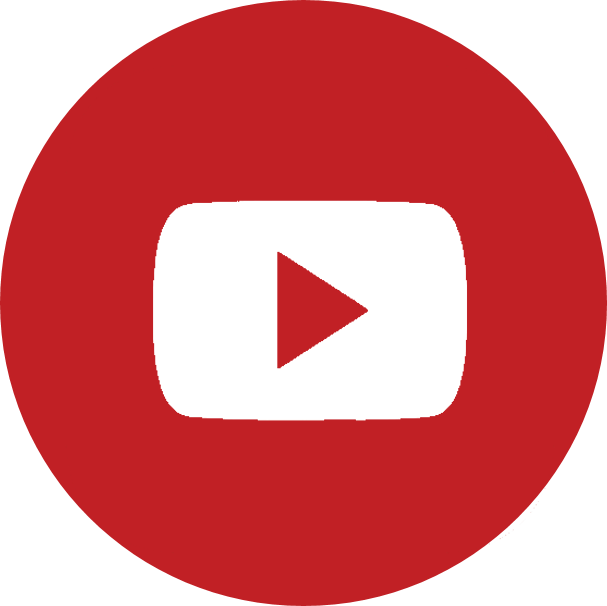 The Good: Captivating gameplay, good player balance, high interaction. Components are high quality, but I've come to expect that from Starling. The Bad: Some spells seem slightly overpowered, but I'm writing that off due to inexperience. I'm sure I'll find ways to counter them as I continue to rack up plays. Foiled spell cards are not worth it. Just a little too fiddly. Score: Overall, Archmage is a great addition to my collection, and I'm very happy it's there. It will get brought out when my group is looking for something a little crunchier, but doesn't want to get into Imperial or a more complicated Eurogame. Heerema has done a great job of keeping the balance correct while leaving enough meat on the bone for a really great last few rounds. I'm giving Archmage a score of Magical. Archmage Ascendant is on KICKSTARTER now. Campaign ends November 29, 2018. 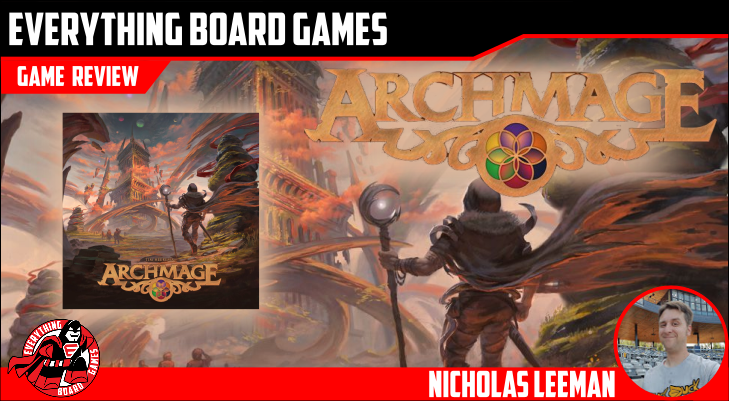 Nicholas has been a board game evangelist for over 10 years now, converting friends and family alike to the hobby. He's also a trained actor and works summers as one of the PA announcers for the St. Paul Saints. He lives in Minneapolis, MN with his board gaming wife and son.